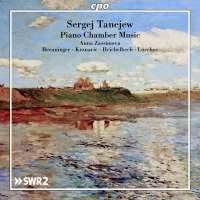 Russia in the late Romantic era didn’t produce much chamber music of note, but Taneyev’s three works for piano and strings go some way towards compensating. There are plenty of distinctive Taneyev (Tanejew to his German friends) traits here, particularly the baroque genres of individual movements and the often intricate counterpoint. But there is no sense of pastiche or anachronism, and sophisticated, lyrical and memorable melodies are the order of the day. The Piano Quintet, in particular, is a very fine, and scandalously underrated work. That said, Taneyev’s name has been kept alive through the 20th century by Russian musicians, and those with an interest in his chamber music will find most of it at least adequately served on recordings by Russian ensembles. For the string quartets, the Taneyev Quartet recordings on Northern Flowers are first choice (although the Carpe Diem Quartet versions on Naxos are also very fine). For the piano and string works, there are two heavyweight contenders, a historic recording of the Piano Trio from Oistrakh, Knushevitsky and Oborin, and a more recent recording of the Quintet and Trio from an all star line-up led by Mikhail Pletnev at the piano. The Pletnev recording takes some beating. The individual contributions of each of the players are of the highest quality, as is the unity of their ensemble. But this new recording from Anna Zassimova and her colleagues comes close, and may even equal it. Theirs are very different interpretations though, equally atuned to Taneyev’s ideas, but taking them in a different direction. Where Pletnev and co keep tight control of tempos and dynamics to focus their expression within a narrow range of musical gestures, Zassimova’s ensemble instead push the boundaries. Slow sections are taken slower, fast ones faster, and dynamics regularly go to extremes. The result is a more Romantic Taneyev, less formal and more immediate. The sheer lyrical lushness of much of this music often takes it to the boundaries of good taste, and while Pletnev steers a safe course, Zassimova regularly goes closer to the edge. But the risk-taking pays off, and the heart-on-sleeve expression that results only amplifies Taneyev’s achievements here. Another risk that Taneyev runs is formal incoherence. Although he is almost always using tried and tested formal models, he regularly expands them, or applies them to music that’s too broad for the limitations they set. In this respect, Pletnev’s more cautious approach seems wiser. The first movement of the Quintet for example, begins with a long Adagio introduction before launching into the Allegro. Pletnev’s slow introduction isn’t as slow as Zassimova’s, nor is his fast main theme as fast. Also, Zassimova applies a great deal of rubato to the introduction, and plays it extremely quietly. The result is a contrast between the two sections that is so stark that the structure of the entire movement seems threatened by it. Not so in the Pletnev, where a thread of continuity is felt right from the beginning to the end. Conversely, the ending of the Passacaglia third movement works better in Zassimova’s more fluid tempo. Again, Taneyev paints himself into a difficult corner: he has had the passacaglia bass line running almost continuously throughout the entire movement – but how to stop it at the end? His solution is to progressively add in rests between the individual notes to disrupt the flow until it finally grinds to a halt. By following the letter rather than the spirit of this coda, Pletnev misses the point (though he does so very elegantly), and Zassimova’s more conscious dissipation ends the movement much more smoothly. Very hard, then, to pick a clear winner between these two recordings. One deciding factor in Zassimova’s favour is the inclusion of the Piano Quartet, an even more obscure and neglected work, but one almost equally deserving of wider attention. Choices for recordings of this work are even more limited. There’s one by Maria Yudina, of all people, and a more recent Northern Flowers release in the same series as the Taneyev Quartet cycle. Again, Zassimova and her colleagues give as good a performance as you could wish, bold and Romantic, but also clear and precise. By a whisker then, this recording gets the top recommendation, even if Pletnev is relegated to second place with much reluctance. If you don’t countenance even the suspicion of Romantic excess, buy the Pletnev in preference to this. But whatever you do, buy at least one of them.